It takes between 30 to 35 hours to 3D print a car. This means we could order and receive our own personalised car in less than a week. During the morning commute in Malta we are surrounded by cars. We take these products for granted, and very rarely do we think of how or where they’re made. Most of the time this is because the factories that make these cars are in countries far away, or places we rarely visit. But this may change in the near future. Advances in technologies are revolutionising the way many products are made, and these changes will soon be coming to a neighbourhood near you. The next car you buy may be produced using 3D printing, also known as additive manufacturing, and assembled by a team of robots and humans just down the road from your house. This is the vision for the urban factories of the future, where production will not be segregated to large factories in industrial estates, but rather will happen in small sites of production closer to your home. While 3D printers and robotic automation have been an industrial reality for many years, scaling these up and using them for mass manufacturing cars takes us to the cutting edge of technology. 3D printing a car could bring with it many advantages. One of these is the possibility of customising the car to our own personal style. This will not be limited to the colour of the car or the vehicle interiors, but would extend to the shape and form of the car itself. Another advantage is shorter delivery times, that is, the time it takes from when we order a car to when we receive it. 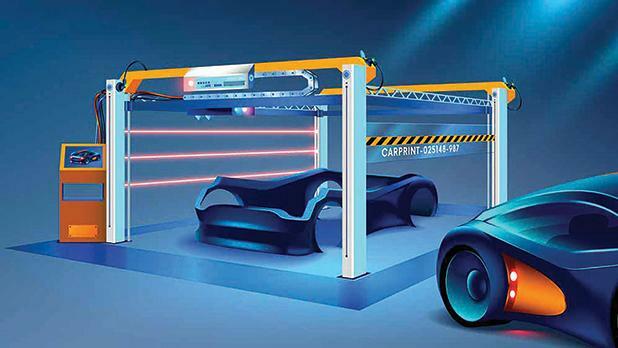 Companies that are developing 3D printed cars report that it takes between 30 to 35 hours to 3D print a car. This means we could order and receive our own personalised car in less than a week. 3D printing and urban production would also mean that production of cars could be greener, cleaner and more efficient. The number of components required to manufacture a car currently number in the thousands. 3D printing could allow us to minimise these significantly. This, together with the fact that plastic components replace complex metal parts, means it would be easier to recycle and remanufacture parts when the car reaches its end of useable life. Traditionally the thousands of components that make up a car are manufactured in many different factories and locations all over the world. These then need to all be shipped to the car assembly plant where all the components are put together. The assembled vehicle then has to be shipped out to the final customer. For example, the car seats could be made in Poland, the engine in Germany and the steering wheel in China, and these need to be shipped to an assembly line in France, before being delivered to a customer in Malta. Manufacturing and assembling the car components closer to home will reduce the amount of material transportation required and therefore reduce the car’s carbon footprint. 3D printing is not the only technology that is changing the face of manufacturing: new and improved materials, collaborative robotics, augmented and virtual reality, the industrial internet of things and artificial intelligence are revolutionising the manufacturing world. And this revolution does not stop at car production but also applies to other products, such as your next pair of shoes or mobile phone. At the University of Malta’s Faculty of Engineering all the basic engineering principles involved are taught in both undergraduate and postgraduate courses. Practical research projects are constantly being developed which drive the technology development forward every time. The 29th edition of the annual Engineering Projects Exhibition will be open to the public on Saturday from 9am to 1pm and next Sunday from 9am to 1pm. This year a total of 97 projects carried out by undergraduate engineering students during the final year of their four-year Bachelor of Engineering (Hons) degree programme will be showcased in the various laboratories of the Faculty of Engineering at the Msida campus. The projects deal with a wide range of topics, including the biomedical field, renewable energy, the environment, electronic products, robotics, transportation, manufacturing processes, new materials and surface treatments. For further information visit the websites below. Dr Emmanuel Francalanza is a lecturer at the Department of Industrial and Manufacturing Engineering of the University of Malta’s Faculty of Engineering.